Lighter vehicles are becoming very appealing as plans for future transportation get made. For this reason and more, we could start seeing more of an obscure transition metal. As with many other natural resources, Australia is lucky with scandium. A collection of companies is developing mines in the country, including the world’s first scandium-only mine, owned by Scandium International, at Nyngan, New South Wales. They all hope to do what nobody else is doing: ensure a stable, reliable and affordable supply of the rare earth element. Asked why it interests him as a chemical engineer, John Carr, Executive General Manager Sales and Marketing at Clean TeQ, said, “Many people think that scandium is a fictional element, but it’s on the periodic table! 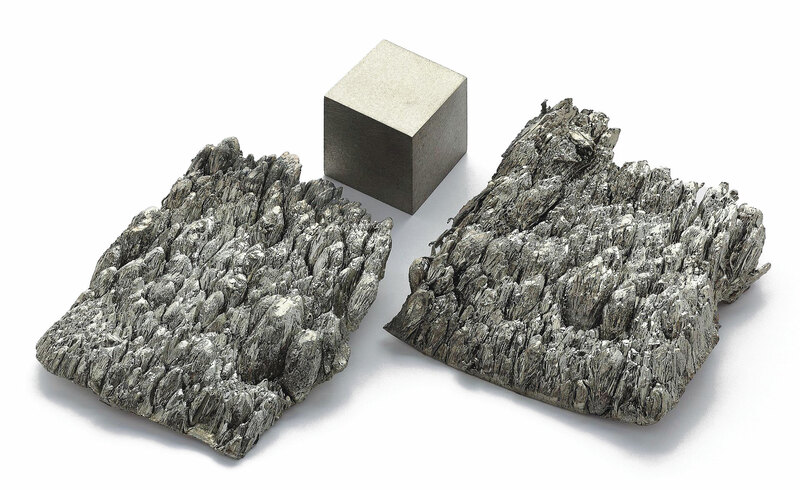 “I find it amazing that adding scandium in such small amounts to aluminium can have such a profound impact on its physical properties,” he said. Clean TeQ aims to bring its Sunrise project in central NSW online in late 2020. Small amounts feature heavily when talking scandium. Carr says the total production of scandium oxide, the form in which the metal is commonly traded, comes to 10-15 tonnes per annum worldwide over 40 to 50 suppliers. Scandium has a low affinity for itself and is therefore found in tiny concentrations, generally well below 100 parts per million. It is thus expensive to process and generally ends up in tailings. However, its ability to greatly strengthen aluminium alloys — as well as adding other desirable qualities — when present in quantities well under 0.5 per cent, means this ‘spice metal’ is interesting. “It’s hard not to get overly excited about it. And aluminium as a metal is completely widespread,” Alex Kingsbury, founder of Additive Economics and the former Director of CSIRO’s Lab 22, told create. Scandium has the ability to keep the grain size of a cooling alloy small, cuboid and evenly-spaced, instead of forming longer crystals. Such alloys are described as weighing the same as regular aluminium, but have strength relative to titanium and a ceramic-like hardness. Other benefits include better corrosion resistance. This is while keeping the recipe relatively simple, and generally also including small amounts of zirconium, silicon and magnesium. “Because we don’t put a lot of scandium in the material, you don’t affect the other key properties too much,” said Dr Thomas Dorin, Associate Research Fellow at Deakin University’s Institute for Frontier Materials (IFM). Fix the supply issues and scandium could open up new opportunities for engineers looking for lightweight transport solutions and more. In Australia and elsewhere, considerable effort is being made to make this so. 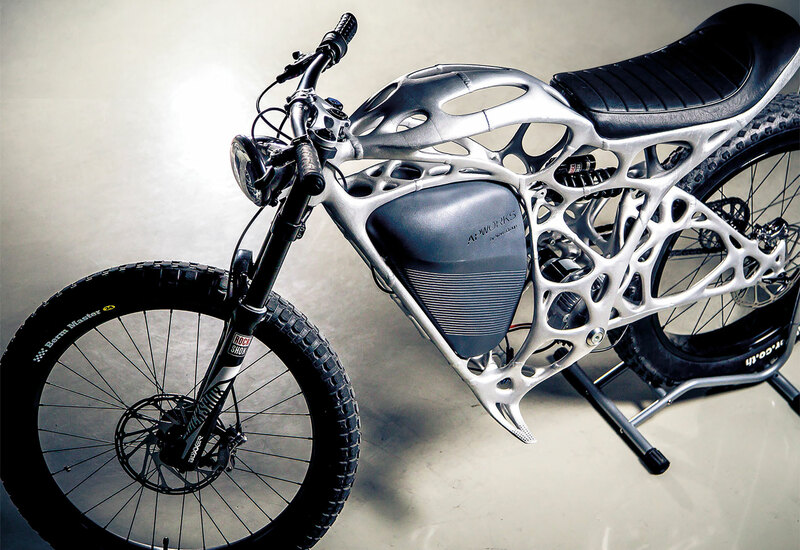 A spectacular demonstration of APWorks’ Scalmalloy (scandium, aluminium, magnesium alloy) additive manufacturing feedstock formula is its Light Rider electric motorbike. Stripped down through its “bionic algorithm” design and use of the lightweight alloy, it weighs only 35 kg. Scandium’s value for aluminium alloys is nothing new to the aerospace industry. Some of the original alloy recipes go back to the 1960s and were applied to parts of Russian MiG fighter jets. However, Carr said, “very little work has gone into more commonly used alloys in automotive, such as aluminium-magnesium-silicon (6xxx) alloys”, and work has been limited to high-value applications. Road vehicles, facing a carbon-constrained world, will likely be forced to slim down to burn less fuel or offset heavy batteries. Carr and others are looking towards this scenario. Clean TeQ is focusing its scandium efforts on two application families: solid oxide fuel cells and lightweighting opportunities for transport. This has included work with United Aerospace Corporation (UAC), a US-based supplier to Airbus. 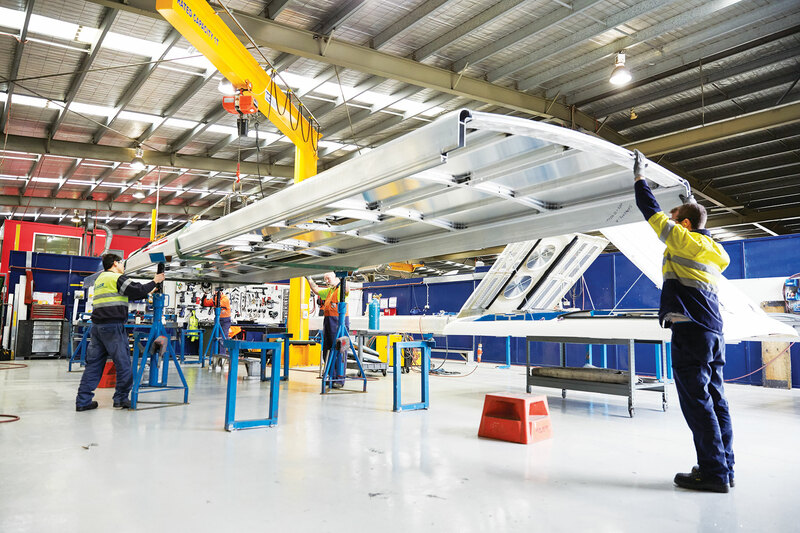 More recently, Clean TeQ has begun working with the bus manufacturer Volgren, which has ambitions of stripping a tonne out of its aluminium-bodied Optimus models. Dorin, who heads aluminium research at Deakin’s IFM, led both the UAC work and the current Bus Optimisation Project. He said scandium improves aluminium’s extrudability, formability and weldability. Zirconia and silicon are also part of the alloys being investigated. “The advantage of scandium compared to other strengtheners is, with scandium and zirconium you are going to retain your strength in the weld,” he said, adding that new alloys also throw up new design challenges. “If we were to design an alloy which has better mechanical properties — strength — then we have to see if it translates into light weight,” he said. He stresses that lightweighting the bus parts requires close collaboration between materials experts and designers, and not simple substitution. The combination of strength plus plasticity in scandium alloys creates new, more elegant design possibilities, according to Clean TeQ. Other properties that are interesting for the transport industries include improved performance against corrosion, a plus for marine applications. “Even though they use aluminium in marine, that still will corrode over time, and that process is slowed,” said Andy Sales, founder and Managing Director at AML Technologies. “Lifelong fatigue-life and corrosion-life is improved.” Sales’s company sees potential in providing such alloys, deposited through arc welding, in the defence, aerospace and marine industries. “The applications themselves can be anything from general structural gussets or structural items: big panels, gusset plates on them rather than welding them on. 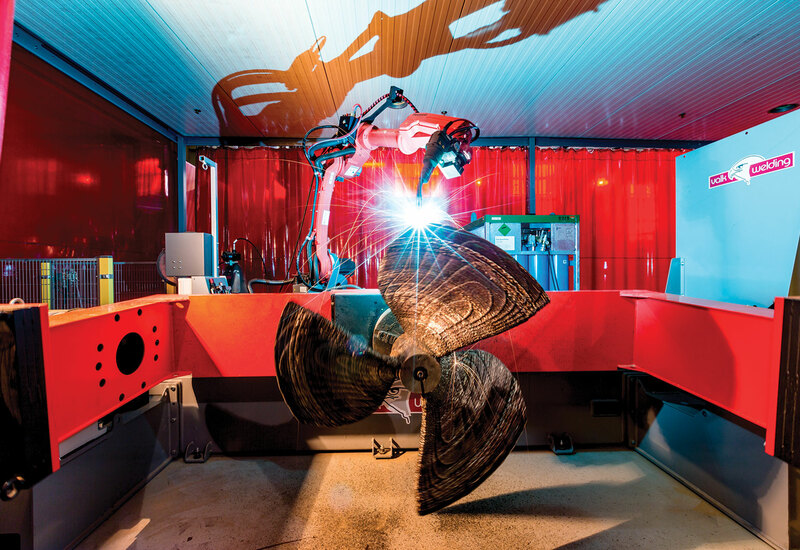 These things are then additively manufactured, rather than as welding pieces together, which takes time,” Sales said. Metal additive manufacturing has a number of shortcomings that generally rules it out for creating such large, structural items. Build rates offered by laser systems are too slow and the size of parts is too small. Cranfield University in the United Kingdom is a hub of expertise when it comes to overcoming these and other limitations. 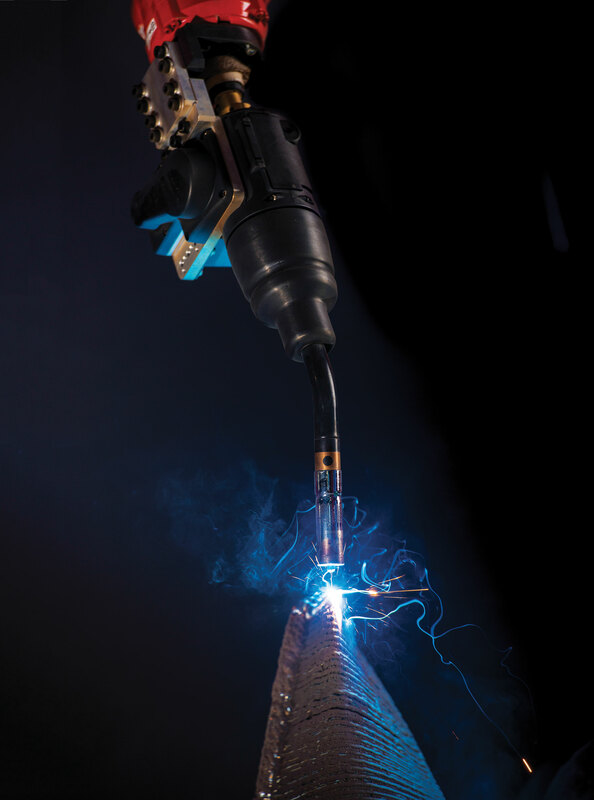 It has been at the forefront of wire and arc additive manufacturing (WAAM) since the early 1990s, combining robotics and welding technology to enable a freeform method capable of producing large structures. A demo 2.5 m by 1.2 m aluminium wing rib, for example, was built in under a day for Bombardier Aerospace in 2014. Sales returned from Cranfield, where he earned a Master of Science in Welding Engineering in mid-2013, and he has since been chipping away at commercialising WAAM technologies. “A few years ago, there was nothing really to commercialise; it was just a lot of research work,” he said. Commissioning at AML’s Salisbury, South Australia, site was completed this past January, and it joins Norsk Titanium and RAMLAB as companies bringing WAAM to the market. Sales has ambitions to disrupt casting and forging methods for engineered structures, as well as to lead the world in the additive manufacture of aluminium-scandium alloy. He describes his system as using an off-the-shelf robot and welding equipment, with the smarts residing in the integration and the company’s software. This comes with a library of different metal feedstocks, and controls things like the path planning of the system. 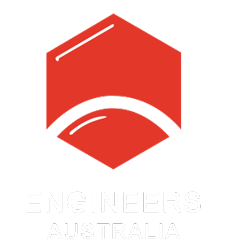 “It will optimise each layer to the size of, said, [the] weld bead and weld deposit that we decide to choose for that particular part, and it all varies between the different metals,” he said. Earlier this year Sales’s startup announced an agreement with Scandium International to use the miner’s scandium in wire alloy trials. Sales said he sees such alloys as perhaps being competitive against titanium one day. In lower grades, titanium offers corrosion resistance but is actually 40 to 50 per cent heavier than aluminium, he explains. It is only at aerospace grades where that corrosion resistance is combined with significantly greater strength than steel. Others have ambitions of shaking up the 3D-printing world with scandium alloys. APWorks, owned by Airbus, included scandium as an ingredient in Scalmalloy, which it calls the first material specifically developed for additive layer manufacturing. And Metalysis, a UK metals processing company, has partnered with Australian Mines and will use the latter’s scandium oxide in trials of master alloy powders. As with earlier high-promise materials, it is possible that this excitement will amount to nothing. There are many barriers to the adoption of scandium. There is no exchange, no transparency, and no real knowledge about the current supply. She mentions “plus 10 years” when asked about the possibility of a scandium industry and said this could even be driven by solid oxide fuel cells. Some questions remain. If widespread production ever began, would it crash the market, and what would that mean for producers? Another factor is that the mature supply chains that would be critical for an aerospace company to consider adopting scandium alloys would take time to emerge. There’s optimism for this wonder material, though. Dorin said that it’s possible that scandium alloys could rival other light metals “10 years from now”, citing the automotive application he’s working on, as well as possible demand from the construction industry. Carr hopes the Bus Optimisation Project has a “fundamental impact”. Proving the value proposition in automotive alloys, he said, has the potential to dramatically increase their rate of uptake. This article originally appeared as “Harder, better, stronger” in the October 20108 issue of create magazine.